How many disaster-related casualties were there in the Great East Japan Earthquake? How many disaster-related death were caused in the Great East Japan Earthquake? Disaster-related deaths are not direct damages from disasters such as tsunami or collapsed houses. Rather, they occur as results of onset or exacerbation of diseases due to the stress of evacuation, low quality of life (QOL) and so on. According to the data issued by the Reconstruction Agency, the number of disaster-related deaths associated with the Earthquake was 3676　(31 increase from previous year) nationwide as of March 31, 2018. Among those 2227 (27 increase) were in Fukushima Prefecture ( http://www.mhlw.go.jp/file/06-Seisakujouhou-12200000-Shakaiengokyokushougaihokenfukushibu/h27kakutei-shinsai_3.pdf in Japanese). Among those, physical and mental fatigue from living in shelter, stress from being moved to shelters and also about 20% was caused by delay of initial treatment due to the lack of access to functioning medical facilities after the earthquake and tsunami. Stress of not being able to go back home also resulted in number of suicides. The survey published by the Cabinet Office in March 2016 (http://www.mhlw.go.jp/file/06-Seisakujouhou-12200000-Shakaiengokyokushougaihokenfukushibu/h27kakutei-shinsai_3.pdf also in Japanese) showed the number of suicides related to the disaster was 155 from June 2011 to December 2015 in Iwate, Miyagi and Fukushima Prefecture, where most heaviliy hit by tsunami. The figure decreased both in Iwate and Miyagi Prefecture: from 22 (2011) to 1 (2015) in Miyagi and 17 to 3 in Iwate. But it increased in Fukushima, from 10 to 19 during the same period. Cases in Fukushima account for more than half of the total of the three prefectures. 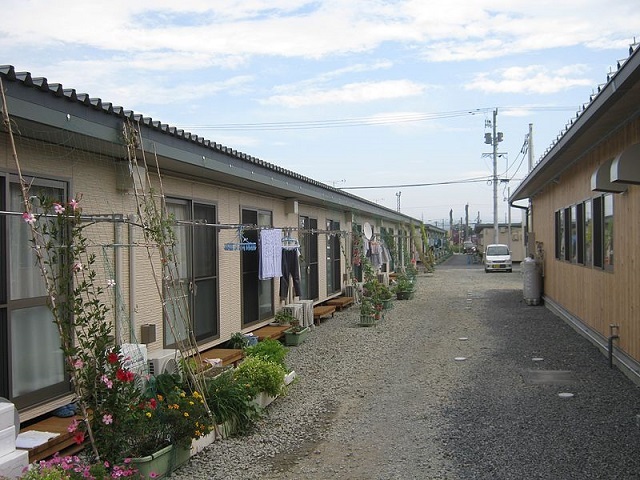 As part of the residents health survey, Fukushima Prefecture has been conducting mental health check up regularly. As the measurement they use The Kessler Psychological Distress Scale (K6) to know the extent of mood or anxiety disorders. Residents of Fukushima score 7.1 on average, more than twice the national average 3.0. In general, mood disorders such as depression is suspected when it exceeds more than 10. Depression or PTSD (post-traumatic stress disorder) among those who are forced to live away from home can increase the risk of suicide. They also can lead to lifestyle diseases such as diabetes, kidney disease from too much drinking. When lifestyle diseases get chronic, they increase the risk of cancer, stroke or heart disease.